Turkey - a nation of smokers - on Sunday extended a ban on indoor public smoking to bars, restaurants, and even to traditionally smoke-filled village coffeehouses. The ban came into effect despite protests from bar and coffeehouse owners who fear it will ruin businesses that have already been hit hard by the economic crisis. 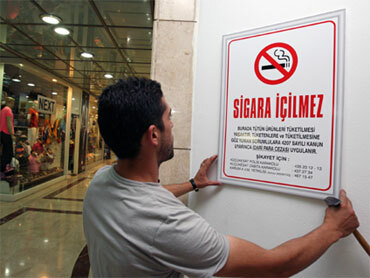 Prime Minister Recep Tayyip Erdogan's Islamic-oriented government barred smoking in offices, public transport and other public places in May 2008 in an effort to reduce the country's high smoking rates and the effects of secondhand smoke on people's health. Bars, restaurants and cafes were given a grace period that ended at midnight Saturday. "The country woke up this morning having carried out a cigarette revolution," commented Radikal newspaper on Sunday. "Smokeless life has begun," headlined Milliyet newspaper. Health Minister Recep Akdag says smoking rates have dropped 7 percent since May 2008, when the ban on indoor smoking was introduced. He says more people will give up smoking now that bars, restaurants and cafes are also smoke-free. The government has dismissed the bar and coffeehouse owners' protests and rejected requests that special smoking rooms be set up to make sure that smokers keep coming. "There is no reason for (cafe and bar owners) to be worried. The public supports a smoke-free environment and the only ones to suffer will be the cigarette producers and sellers," Akdag told reporters. "We are working to protect our future, to save our youth," Akdag said. Under the new legislation, patrons violating the ban will be fined 69 Turkish Lira ($45), while owners who do not enforce the ban could be fined between 560 and 5,600 Turkish Lira ($366-$3,660). Littering with cigarette butts carries a 25 Turkish Lira ($16) fine. Turkey is also setting up a 4,500-person force to carry out surprise checks on bars, restaurants and coffeehouses and help enforce the ban. "To smoke like a Turk" is an expression used in many European countries to describe heavy smokers and the government says more than 100,000 people die annually in Turkey from smoking-related illnesses. The government insists the ban has the public's support. But there was little evidence of that support on Sakarya street in Ankara, lined by fast food outlets and bars. Posters on windows read: "We oppose cigarettes as well as the smoking ban." Bar and restaurant owners were planning to stage a protest later on Sunday. At EskiYeni (OldNew) Bar on Sakarya, customers feted the "The Last Night of Smoking" Saturday, dancing to the rhythm of cigarette-themed '60s and '70s Turkish songs, including: "If only I could wrap you in my cigarette smoke and keep you forever" and "My drink and my cigarette are my only friends but would they leave me too if I had no money?" "I think half of the bars on (Sakarya) street will go out of business," said Caglar Ozcan, who owns EskiYeni. "They are already suffering." DJ Alper Fidaner said he smokes two packs every evening when working. "I don't know how I will cope next week," Fidaner said. "I will have to put a record on and rush out for a smoke." At Umut Folk Songs bar in Istanbul's entertainment district, Taksim, waiters began removing ashtrays at midnight as the singer announced that the ban on lighting up was in place. Customer Huseyin Akyuz handed over his packet of cigarettes and lighter to the waiter, saying he was quitting. Others walked outside to smoke. Erhan Kaya, a 30-year-old businessman, welcomed the ban and said he might even start going to the traditionally smoke-filled neighborhood coffeehouses where Turkish men usually pass time smoking and playing backgammon. "I would never go because of the smoke," Kaya said. "But I think I will start going now to play backgammon." Yesilay, an organization devoted to reducing alcohol and tobacco consumption, says around 40 percent of Turks over the age of 15 are smokers, consuming around 17 million packs a day.